We are proud to welcome our newest team member, Oz. Oz, from Naio Technologies in France, has helped us eliminate the use of herbicide chemicals on our Scottish, and Spanish farms. In the spring of 2019 he will be making his debut in Ontario to help reduce and eliminate weeds, without the use of chemicals. 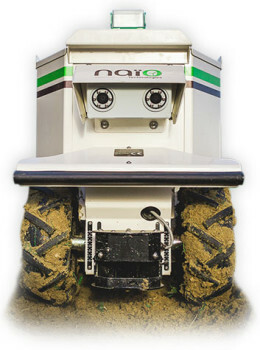 This robotic miracle worker (all our team members are miracle workers in our eyes) quietly and effectively patrols our fields seeking and destroying weeds. In the process it manages to loosen and aerate the soil. It works night and day, keeping our crops safe from weeds, and you safe from deadly chemical herbicides.